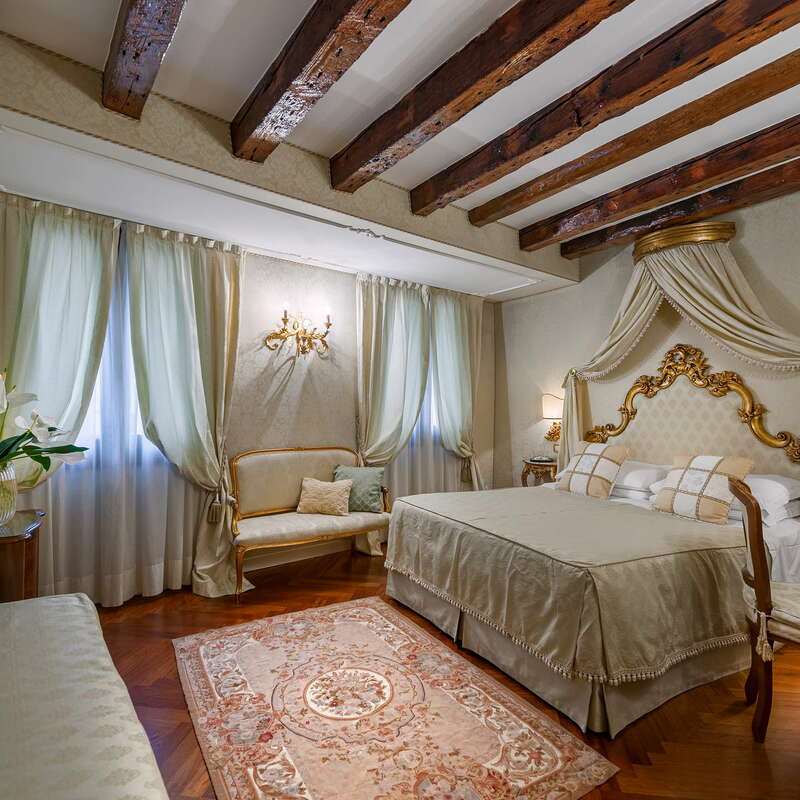 As the home of Doge Mariner Falier, the Venetian leader executed for treason in the 14th century, Hotel Antico Doge oozes character and history, from the splendidly decorated guest rooms to the gorgeous breakfast area. 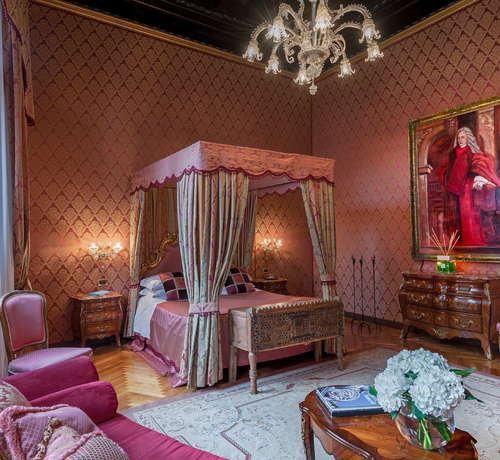 Plus the price is unusually reasonable for this level of attractiveness and central location. YOU SHOULD KNOW There’s no elevator here, so you may want to stay elsewhere if you can’t deal with stairs. 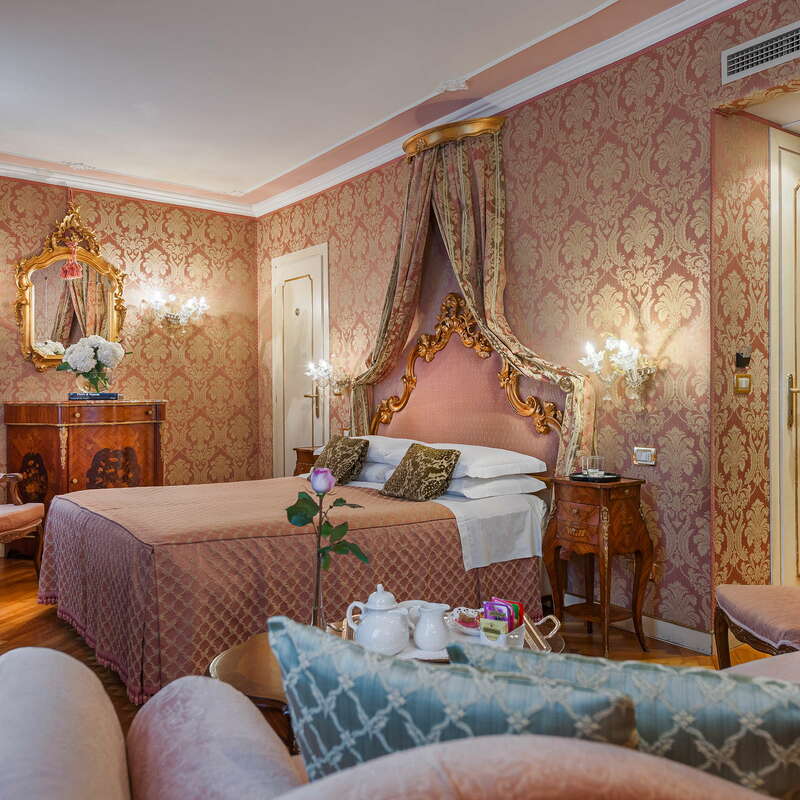 Lovely guest rooms are a good size for Venice and are decorated in 18th-century Venetian style, all pale pinks and golds. 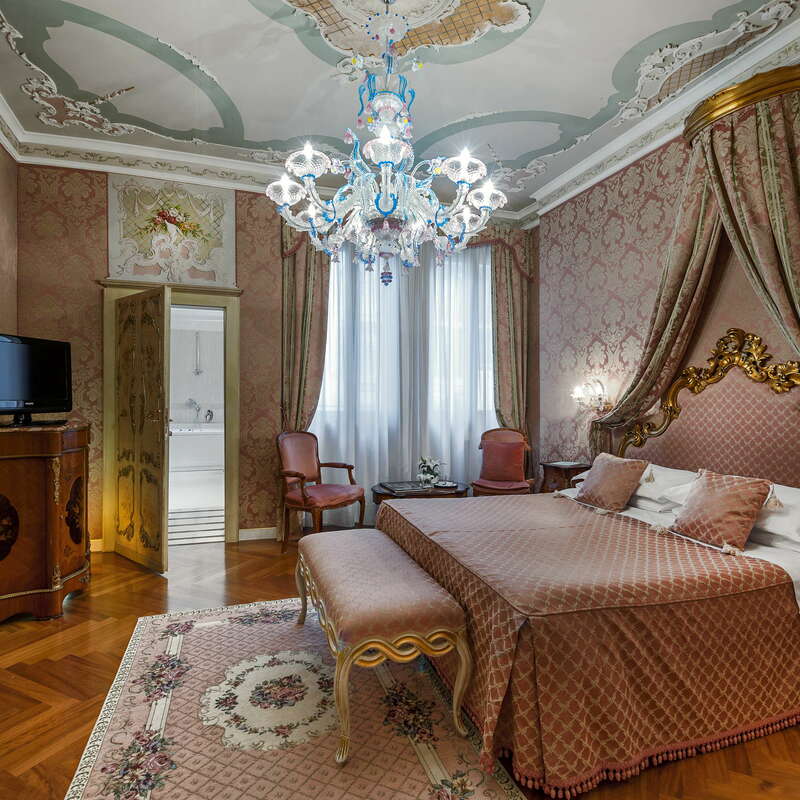 All rooms have patterned silk walls and gilt mirrors; some offer canopy beds and Murano chandeliers. 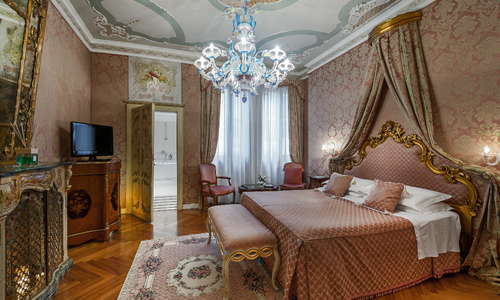 There are also triple and quadruple rooms, if you’re traveling with your family or a group. Many of the large, contemporary bathrooms come with tubs-shower combos. To truly relax after a long day of wandering, ask for one of the rooms with a Jacuzzi tub. Not much more than a check-in desk, there’s really no place to hang here. 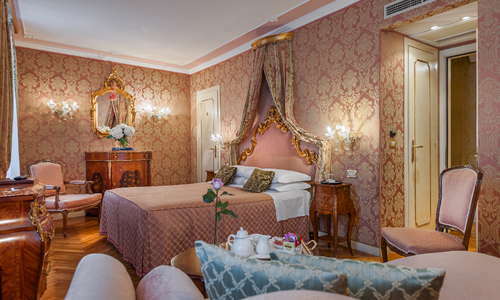 Hotel Antico Doge doesn’t have its own restaurant, but a complimentary buffet breakfast is served in the fabulous breakfast room, which has a beautiful frescoed ceiling and Murano glass chandeliers. 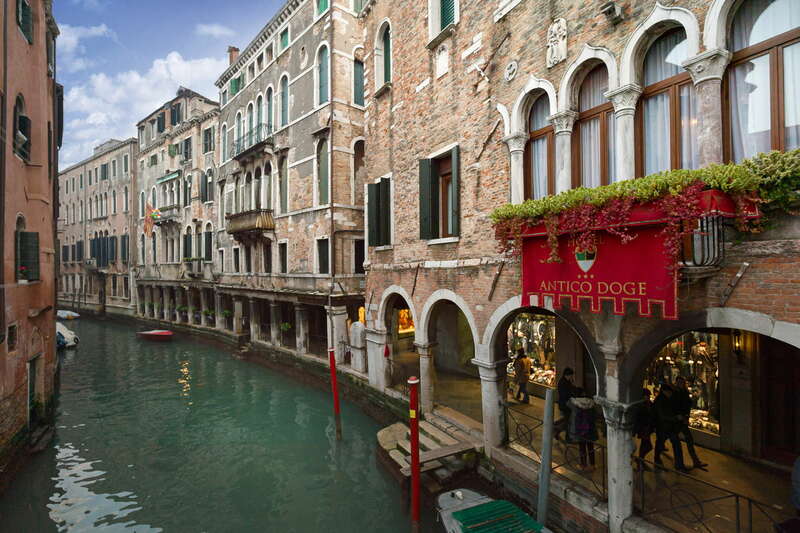 A ferry from the Ca’ d’Oro vaporetto stop (4-minute walk) will drop you off in San Marco and other locations around Venice, or hop on a traghetto from the nearby Santa Sofia stop (3-minute walk) directly across the canal to the Rialto. Otherwise, if you want to walk, the Rialto Bridge is extremely close. Cozy Osteria Ca’ d’Oro alla Vedova (3-minute walk) is known for its polpette (fried meatballs) and local vino. Reserve in advance for a great selection of traditional dishes—especially the seafood—at Osteria La Bottega ai Promessi Sposi (2-minute walk). Charming family-run Vini da Gigio (5-minute walk) offers tasty pastas and seasonal dishes with a great wine list. Petite wine bar Un Mondo di Vino (2-minute walk) is a great place to enjoy aperitivi (wine or spritz and bar snacks). El Sbarlefo Cannaregio (25-minute walk) offers delicious cicchetti like the classic sarde in saor (sweet and sour sardines), plus a good choice of wines and cocktails, while VinoVero (8-minute walk) has a lovely selection of wines by the glass and tasty nibbles. 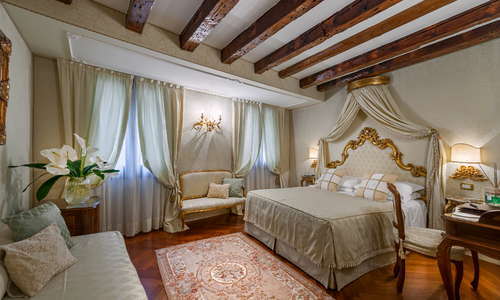 The décor is lovely, the location fab (if a bit busy outside, but it’s Venice after all), and the price is right.